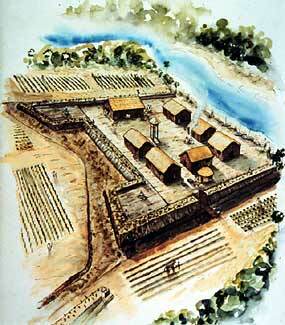 Artists' rendering of the reconstructed version of Fort Mose. Drawing based on research by historians Albert Manucy and Luis Arana. The first fortress at Mose was destroyed in the fighting of the 1740s, but another was rebuilt in 1752. Throughout this period, despite a series of coordinated British attacks, the black warriors of Mose were never conclusively defeated. They ably defended St. Augustine, repulsing the armies of their former masters. Word of their courage spread to the British plantations. For desperate slaves to the north, Mose secured a fortress of hope.